I never actually considered the idea of making a homemade graham cracker, Nabisco seems to have a clever market on that. But I though, hey, why not? And bonus, I had planned to make some interesting looking Mini Cheesecakes from the book, and I could use these graham crackers for the crust! 1. Preheat the oven to 350 F and place an oven rack in the center of the oven. 2. 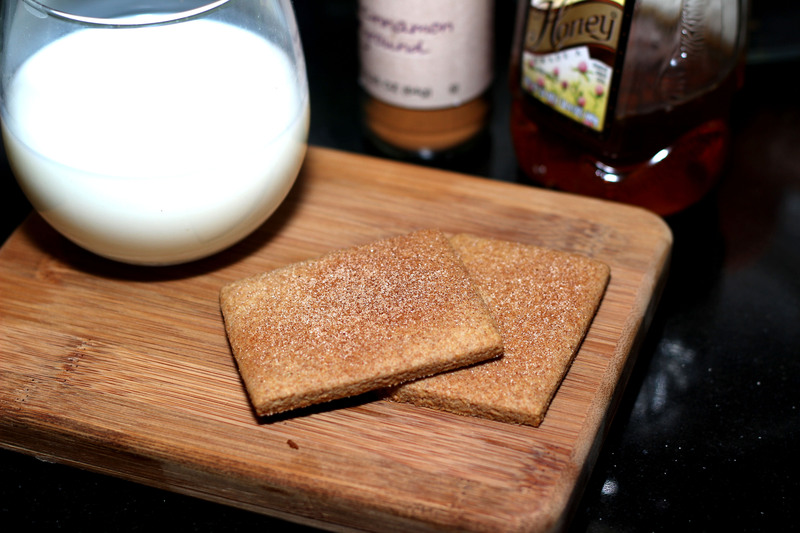 Mix 1 tablespoon sugar and 1/2 teaspoon cinnamon in a small mixing bowl and set aside. 3. Put 1 1/2 cups flour, the baking powder, and remaining 1/2 teaspoon cinnamon in a medium bowl and stir together. 4. Put the honey, and remaining 2 tablespoons sugar in the mixing bowl. Beat on medium speed until smooth and creamy. 5. Add the flour mixture, half at a time to the mixing bowl and mix on low speed until blended after each addition. 6. Pour in the cream and mix until dough is smooth. 7. Sprinkle some of the flour on a clean work surface and turn the dough out of the bowl. Sprinkle some additional flour on top and spread the dough with your hands. 8. Roll the dough about a 1/4″ thick. 9. Using a knife (or pasty cutter, or pizza wheel), cut the dough into 2 1/2″ squares. Use a spatula to transfer the dough squares onto a cookie sheet.